To find out the extent of U.S. progress toward closure of the international education gap, we provide estimates of learning gains over the period between 1995 and 2009 for the United States and 48 other countries from much of the developed and some of the newly developing parts of the world. We also examine changes in student performance in 41 states within the United States, allowing us to compare these states with each other as well as with the 48 other countries. Our findings come from assessments of performance in math, science, and reading of representative samples in particular political jurisdictions of students who at the time of testing were in 4th or 8th grade or were roughly ages 9–10 or 14–15. For the 49 countries, enough information is available to provide estimates of change for the 14-year period between 1995 and 2009. For the 41 U.S. states, one can estimate the improvement trend for a 19-year period—1992 to 2011. In absolute terms, the performance of U.S. students in 4th and 8th grade on the NAEP in math, reading, and science improved noticeably between 1995 and 2009. Yet when compared to gains made by students in other countries, progress within the United States is middling, not stellar (see Figure 1). While 24 countries trail the U.S. rate of improvement, another 24 countries appear to be improving at a faster rate. Nor is U.S. progress sufficiently rapid to allow it to catch up with the leaders of the industrialized world. 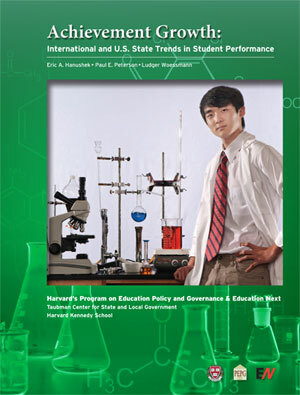 Globally Challenged: Are U. S. Students Ready to Compete? U.S. Math Performance in Global Perspective: How well does each state do at producing high-achieving students?